So this week, the theme was sunshine for my verse and photography. Isn't it funny how when God is teaching you something, everything seems to point to that lesson? This was a rainy week. It was cold and grey. And I thought, "Yeah, Jen. Great job picking a theme for Sunshine in January. You really thought that one through, huh?" Actually, because it was cold, wet and grey, the theme for sunshine and my current thoughts for the week ended up being perfect. I love you, God. You SO knew, didn't You? I am reading a book called "The Good and Beautiful God" and in Chapter 2, it talks about how God is good. All the time. No matter what. The author speaks about how he had a child who was born with a severe chromosomal disorder and she died before age 2. He said that He discovered that God is always good, so God was not punishing him or his wife or his child, but that God had and has a purpose that it is a good one. Good things and Bad things happen to both good and bad people and there is no apparent distinction to why or who. Good things don't come because we did something good and visa versa. This cause and effect doesn't play out in reality and God's goodness isn't dependent on these circumstances. Yeah, yeah, sure, I know this, but actually, I play this mind game in my mind all the time. Maybe I'll do something right and God will reward me with a lottery win. Wait, my car just died? Maybe I'm doing something wrong and I'm being taught a lesson. Actually, God doesn't play that way. Well that seems strange. Um, huh? Well then, HOW is He GOOD? Explain puh-lease! Rather God's unwavering goodness comes not in circumstances but through them. Those differing circumstances are going to come to all people good and bad regardless of what they do. But God is still good. Often His blessings and goodness reflect in internal blessings, such as peace and joy, rather than external . Sometimes it's knowing there is the hope of heaven and of an omnipotent God who sees a plan clearly when we cannot. One day all will be revealed. God is good. He is constantly working out His good plan. The chapter ended by challenging us to sit everyday for 5 minutes and be still and reflect on God's goodness and to notice God in His creation and beauty around us. Now remember it was a cold, wet and grey week. The verse I was reflecting on was one on sunshine and there certainly wasn't a ton of beauty outside that I was seeing. My normally pretty yard needs to be trimmed to the ground ready for Spring but right now it's brown sticks, since I haven't done it yet. Not much pretty sunshine to reflect on there. But one morning, I had to take Tone to work. It was early. And foggy. And cold out. But as I was driving back, the sun came through. Everything was transformed. I was on a particularly high part of the road and I could see the fog stretched out over the fields and the black trees sticking up through the golden light. And today. The sun came out for a half hour. I ran outside and snapped this picture of my rose bush which is mostly sticks with just a few leaves and a couple roses hanging on. 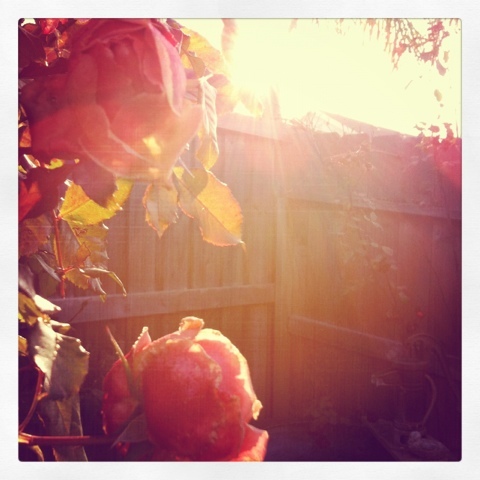 The sun was shining right through those tenacious peach roses. I have also had a very heavy heart this week for friends who have had a very hard blow this week. I have been constantly in prayer as things appear very dark. The darkness of the world outside my window reflected the dark mood and grief I was feeling all week for my friends. I am thankful for beautiful glimpses of light which remind me that God sees and knows and has a good plan. Though the dark clouds still surround, I know that the sunshine is bigger and brighter and right there, just on the other side. For you see, as the Isaiah verse above says, nothing is hidden from God. Nothing on earth. The line in the verse, "I equip you, though you do not know me" is about King Cyrus who God used to help His people though the king did not know God. God uses every grief, every joy. Every person, for His purpose and ultimate plan. You could read the verse two ways. "There is none besides me" can seem commanding and assertive and if you see God as a God who punishes and gives blessings on a whim, it can be frightening. Or you can read the verse differently. "There is none who is as good as me. I see all. I am the light that shines. Trust me. I will use all for my goodness. Even when it's not even good, I will use it for your good. I am God. I have a plan." God's light is so very beautiful when it shines in darkness. It's so very good. It's full of life and healing. It breathes of peace and joy. 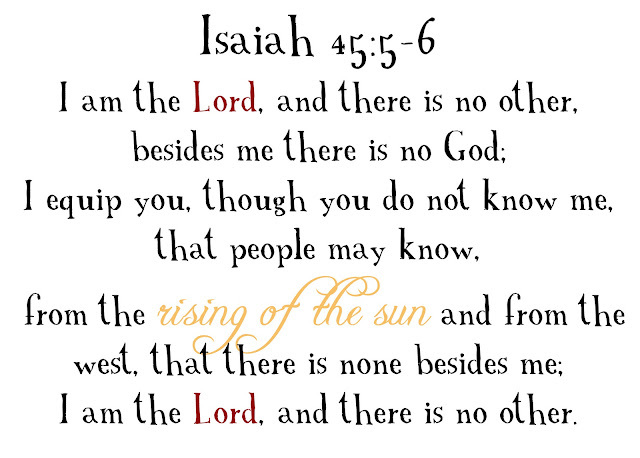 There is no one like my God (as the verse says). No one is as good as Him. No one else can take darkness and make it beautiful and transform it like He can. It turns out that focusing on the fact that no one is like my God and on sunshine on a cold, rainy and heavy week can be a perfect theme. And by the way, I highly recommend the book, "The Good and Beautiful God" by James Bryan Smith. You will see God in a wonderful way.